Author: Subject: Maximum sensible weight for a 200bhp BEC...? Two up it still goes well, but you can definitely feel another person on board. As a few may be able to tell (sorry about all the posts!) I'm scoping out my new project, which needs to include a roof, heater, doors, a reverse and the ability to sit at 80mph ish and not make my ears bleed (i.e. still be a able to hear the radio...). So I've been looking at cars that I like the look of (in a weird way...) and I've been looking at iQs (850kg ish), BMW Mini (1100kg lightened significantly), and even things like BMW Z4s and Audi TTs (1200kgs, best bet). I'm arbitrarily saying 1000kg... Thoughts / experiences?! Its not the power that is the issue with bike engines it is the lower levels of torque and torque is what you need to accelerate the mass of the car. Have you had a look at the classic mini r1 conversions, looks like the ideal solution. These modify the front subframe to accept the r1 engine, bolt it in and use the bike wiring and off you go, just add an electric reverse. For the zzr1400 I would have said 750kg would be max giving you 266bhp/ton but as said the lower levels of torque may not make it feel as quick off the line and I think you will need a well packed exhaust (which may reduce power) and need to do something about induction noise if you are to make it cruise quietly. Also, if this is a road car (unmodified shell etc. so no Iva) are how are you going to deal with emissions at mot with the bike engine as they have different rules iirc and don’t tend to use a cat. (Happy to be corrected). Had a quick look at the torque curve of a zzr1400, there is 80% of the peak torque available from 5500-10500rpm. Red line just over 11000rpm. So at around 80mph, you probably still looking at 6-7k rpm. But in top gear that would give you 140mph top speed. The clutch strength might be the otherr side of the story as well. A Mini with R1 will be a bit below 600kg. Do you lot never listen/pay attention to anything at all??? Just came here to post the same as the above! Modern 'Blades have about a 1.72 reduction in the gearbox, so your 80-90ftlbs (more torque in a car because of the exhaust, providing it's well built...) becomes a bloody good chunk of torque at the prop, as has been said. Weight I used for the CEC was 600kg all up, BEC 500kg all up. Same size wheels / tyres. To put a practical case to it... 70mph cruising in top gear - just over half revs in both the CEC and BEC in this comparison, around where each engine will make maximum torque. Plant your foot and the BEC sends 761Nm to the rear hubs, the 4 speed CEC 825Nm and the 5 speed 718Nm. Add in the weight factor, and the BEC is putting a good chunk more torque per ton to the road. So back to the original question... I don't think it really matters, but lighter the better! I was starting to get a little pessimistic about the aim I have in the next project. You've all helped out a load! I forgot to mention one important constraint... That is has to be RWD and rear engined if possible, so I can use one of Doug's beautiful Westgarage chain LSD diffs (to minimise the 'slop in the transmission' that I just cannot get rid of when driving a front engined VortX and a TRT / Sierra diff combo...). I'm starting to look at a severely lightened Audi TT as the rear end already has an LSD in it and a ZZR1400 engine would fit in there where the rear seats are without stacking the engine above the diff (keeping the CoG low). I've just got to finish the garage (properly sorting it this time...). Duramat floor laid completely rewired, walls painted, 8 new LED bar lights fitted and just re-organising the Fireblade, MNR and lawnmower to get the project car in position. Thinking about a two post lift too, but think the wife may put the kaibosh on that one. I'll lob all the build status up as and when I make some decisions / progress. Not sure whether to get the donor bike first and strip and sell on the parts, or start with the donor car... I suppose whatever turns up first at the right price. Would a Smart Roadster/ Coupe not be an idea? Re the length/packaging issue, don't forget the rear wheels don't need to be inline with the diff, you can run driveshafts angled towards the front at anything up to around 30 degrees using CV's, also, you could always add a "power bulge" to the centre rear of the car to accommodate the diff. On the subject of bike engine torque, I've just checked on a few rear wheel dyno charts and they all show a zzr1400 (1441cc model) with between 112ftlb and 120ftlb, just thought I'd say. Note all measures data at the rear wheel and not corrected to provide at engine results. If you are measuring at the wheels on the dyno does it matter what the engine or gearbox figure is as it is the "at wheel" figure that will provide you with the best estimate of the relative performance (assuming the vehicles are all the same weight/mass and have the same tyres and power train losses) i.e. assuming the wheels do not slip - the amount of energy that can be transmitted from the tyre to the tarmac which is a measure of the torque of the engine AFAIK. As a simple example myself and my wife had everyday cars that both had 100hp, mine was a diesel and hers was a petrol, in terms of acceleration mine was by far the quickest with the only difference being that mine has close on twice the torque (similar weight). A supplementary questions is do the RPM have anything to do with it, the ZZR will be making max torque at say 8k and power at 12k where as the zetec would be at 4k and 7.5k respectively and the deisel 2.5k and 6k respectively. Sorry, so many questions but I am a bit confused so if anyone can explain then that would be very useful. Torque is measured, bhp is a 'theoretical' value that is calculated. Torque is how hard the engine is twisting the prop, rpm tells you how many times per minute the prop is being rotated with that torque. From this you can calculate the total power output which we know as bhp. So you can have a low torque engine that provides that torque many times a second (bike engine), or a high torque engine that does it far fewer times per second (diesel engine with a turbo), and they'll both have done the same amount of work / created the same amount of energy. You also need to look at the area under the torque curve. This shows the total amount of work done by the engine. So your example with your N/A vs diesel turbo car, and the diesel is faster but they both put out the same bhp, it's because of the shape of the curve. Your petrol car's dyno torque plot is (simplifying) a straight line to the limiter, the diesel will have much more torque at low rpm and the shape rises up sharply at the start then is a bit of a plateau, so the area under that line is much greater and it is doing more work across the rev range. 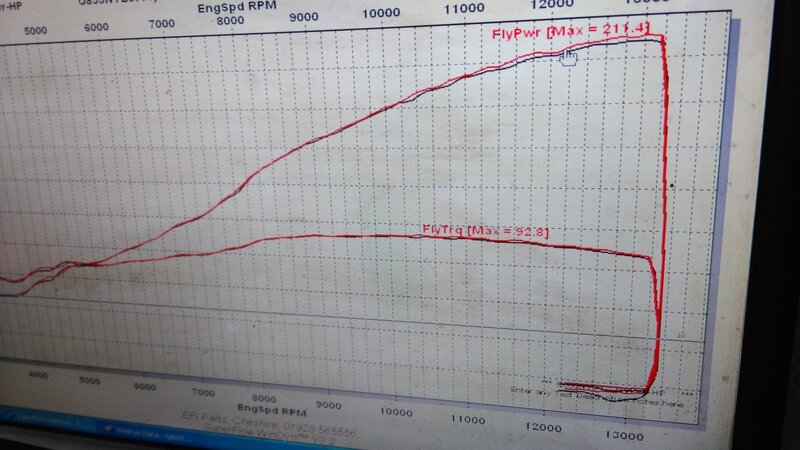 Had my 'Blade on dyno yesterday and it made 92FtLbs / 124Nm and a pretty flat torque curve. With the drop gear that's about 160FtLbs / 213Nm effective output. 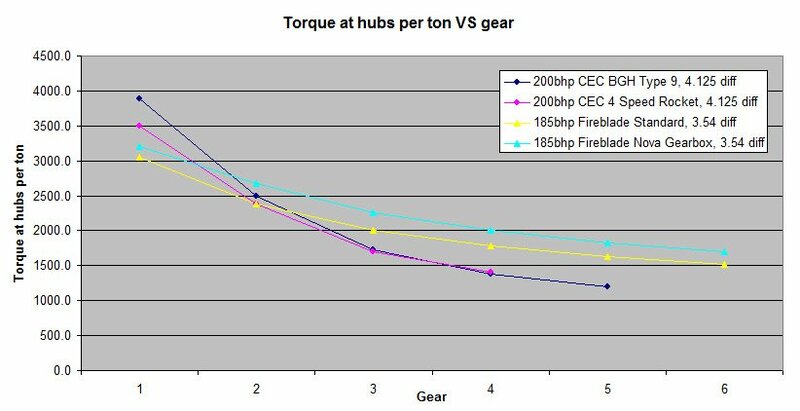 If all three engines in my example are measured at the wheels where does this “drop” gear come in and why that make a bike engine measured at 115ftlb max at the wheels the same as a car engine measured at 160ftlb max at the wheels even if the bike engine is turning 1.5 times more to make what is less torque? As far as I can tell the rollers are seeing different amounts of torque being applied by the tyres so how does a gearing before the wheels make these two different measured figures the same. If all three engines in my example are measured at the wheels where does this “drop” gear come in and why that make a bike engine measured at 115ftlb max at the wheels the same as a car engine measured at 160ftlb max at the wheels even if the bike engine is turning 1.5 times more to make what is less torque? Have to say I find this confusing too. The figure I was giving for the ZZR1400 is the figure from the manufacturer & is, I believe, a flywheel figure. I too would expect the figure taken on a rolling road at the wheels to be comparable for any car whether it be bike engined or car, but given the whole torque multiplication thing would this not mean you recorded different output in each gear??? I can simply say that the ZZR engine drives more like a car engine than what you would associate with a BEC (I can burble along at 25mph in 6th gear! ), the main difference being that when the car engine stops going anywhere at around 7,000 rpm or less, the ZZR just carries right on thro' to the max rpm of 11,500 (can be raised further by flashing the ecu! ). It will also pull away on tickover as long as you have good clutch control! I can only guess, but if you put it in a 1000kg car I would still expect probably 4 second, maybe 4.5 sec 0-60, you would need to gear it a little lower than I have with that sort of weight or would be inclined to bog down off the line. I guess my experience is at the lower power end but if you take 30-60mph acceleration times (real world usability) the diesel was so much quicker than the petrol car with the same power and weight (but different torque). My car engine rule of thumb was 200bhp/ton would give you about 6s 0-60mph. And again for a car engined seven or similar (fury etc.) I always thought the sweet spot for a road car (that was usable in most conditions) was around the 175hp (600kg car). This was enough so you could drive at 8/10's on the road and not be a danger to yourself or other people (assuming suspension, brakes and big nut behind the steering wheel are up to the job). Personally I would expect a 500kg 200hp bike engine car on a track to be much quicker than a 800kg cobra with 400hp, maybe not in that 30-70 test but in terms of cornering speed and ability to maintain speed at a higher level and reduced braking distances etc. - Colin Chapman "added lightness - virtuous circle". As for RPM - I think this is not an issue - if you gear two cars to the same top end, the car engine will reach that at 7k and the bike at 11k - AHHH - light bulb moment - this may be where the "reduction gear ratio" may come in - Think of lifting a weight with a pulley to a certain height you expend a certain amount of Kinetic Energy that is equal to the potential energy you are putting into the weight (mgh=1/2mv^2 iirc) so if you increase the pulley ratio you have to mover the rope quicker to raise the weight to the same height in the same amount of time - same energy expended. So, if the bike engine is running 11k but has a lower max torque it will get to the same speed in the same amount of time as a car engine with greater torque but less RPM. Sorry OP, this has got off topic a bit, I'll shut up now. This is exactly the discussion I wanted! I genuinely think that if I'm investing 3+ years on the next project I want to try to get the best steer possible to get enough momentum to actually do what I set out to do. In theory you should be able to trade off revs to gain torque since power is the product of revs and torque. But in practice I think torque to weight ratio is a factor to. A BMW 323i e46 with 170hp and 1400ish kg was as quick through 3rd gear as a Lotus Elise 111s with 165hp but only dragging 900kg. The only difference is that the BMW had 245Nm which is more than the 180-190 of the Elise. "Personally I would expect a 500kg 200hp bike engine car on a track to be much quicker than a 800kg cobra with 400hp, maybe not in that 30-70 test but in terms of cornering speed and ability to maintain speed at a higher level and reduced braking distances etc. - Colin Chapman "added lightness - virtuous circle"
That's how I see it too, everything you've written actually! IME if you take two cars of the same bhp/ton, the lighter one will always be faster round a track, unless it has stupidly long straights and not many corners. I have a 1700kg 500bhp car and despite very good straight line pace, handling dynamics from Italy's finest F1 team and carbon brakes twice the size of your average kit car, its a dog in the corners and on the brakes compared with the kit cars I've had, you just can't disguise all that weight. It seems the general population think BECs are a waste of time! Just need to try to find some way of getting other ideas on what donor car rear ends are worth considering for this. Maybe I just shouldn't mention motorbikes?! There was an DVD where somebody went through the complete process of building a Z-cars Mini should give you some pointers on the engineering bits. I think converting a FWD shell to midengined rear wheel drive setup is probably not the way if you are really concerned about noise and comfort on the motorway. Also the modern cars have more electronics (CAN Bus) which are more difficult to adapt integrate with the engine change. So I would steer away from most modern cars, unless you go for a wiring loom from scratch. A GTM Libra might be another candidate to convert. LocostBuilders » Forum » BEC » Maximum sensible weight for a 200bhp BEC...?